Pairing wine with food brings out flavor in the food and the wine. Whiskey may also be paired with food with similar results, specifically single malt Scotch. The geography of Scotland produces a variety of Scotches in much the same way that specific terroirs produce distinctive flavors in wine. A nation of islands, the rugged landscape of Scotland offers rocky coasts, springs and mountain streams, fields of heather, bogs of peat and the spray of the sea for the crafting of Scotch whisky. 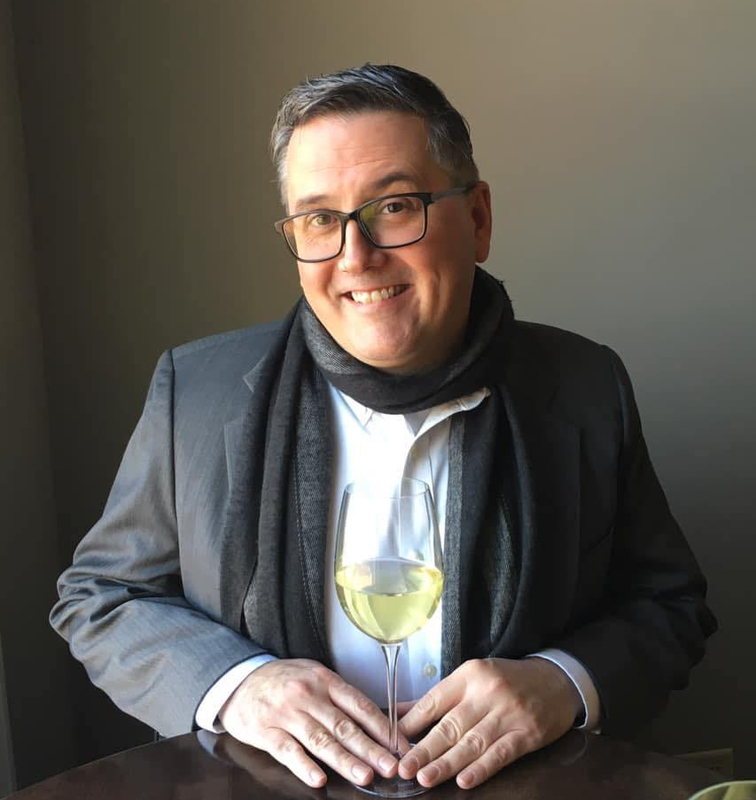 Paul and I recently hosted a a Scotch tasting with our friend Curtis for a group that won a Scotch tasting dinner at an auction benefitting OUTMemphis which included 7 single malt Scotch whiskies with food pairings. We chose Scotch from different regions that present with different flavor profiles. The robust Laphroaig 10 from Isle of Islay tasted like pepper and then sweet caramel toffee against the sharp English cheddar in my mouth and finished with oily gasoline. The Glenmorangie Quinta Rubin Port Cask 12 from The Highlands conveys the taste of sweet oranges in the palette and in the finish which provides a delicious contrast to rich bleu cheese. The Balvenie Doublewood 17 from Speyside tastes like allspice and vanilla on the palate and finishes with notes of vanilla and honey. 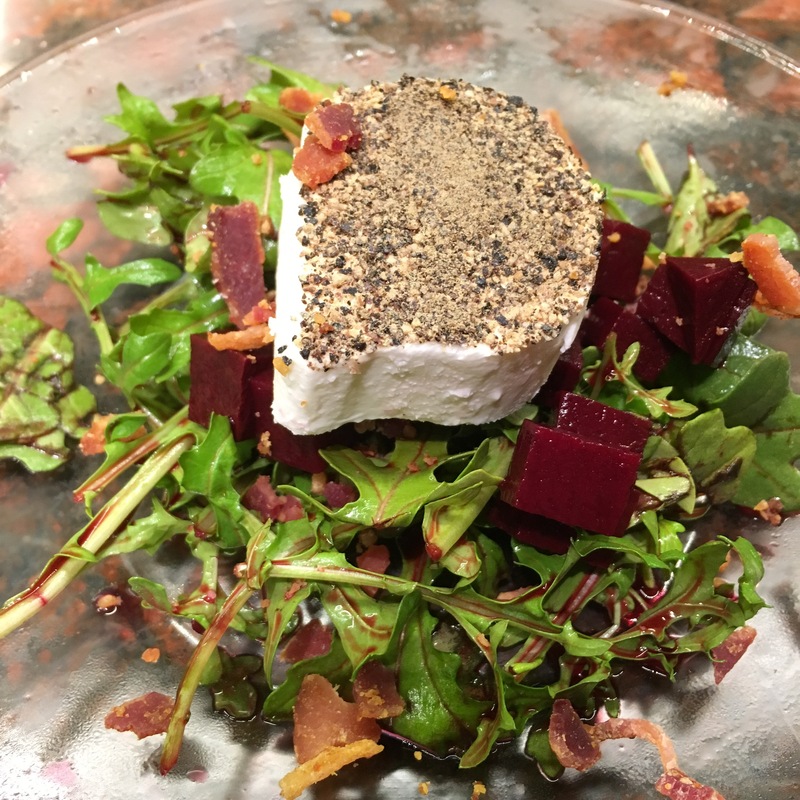 We paired this Scotch with sweetened beets poached in Balsamic vinegar and red wine, creamy goat cheese encrusted with black pepper, peppery arugula and hickory smoked bacon. The most delicate of the single malts on our menu, the Auchentoshan 12 from The Lowlands, was smooth and sweet with hints of tangerine and lime and finished with ginger and a lingering nuttiness. We paired this with a salty, chilled smoked salmon dressed with fresh fronds of fennel. 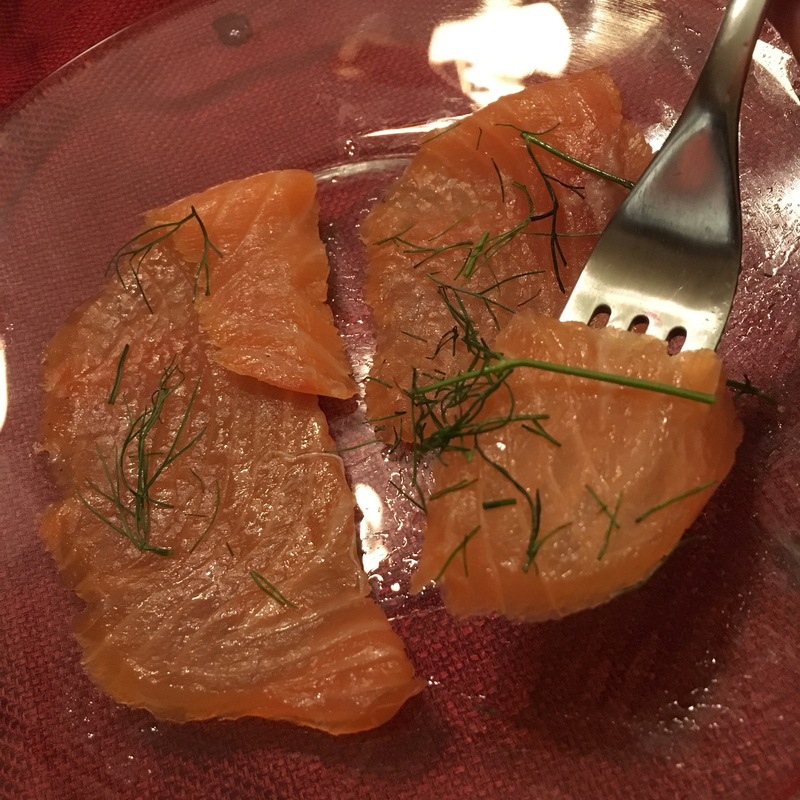 The sweet citrus of the Scotch complimented the fennel and smoked fish. We intended to pair the sweet, smokey Clynelish 14 from The Highlands with a Butternut Squash Gnocchi with butter, nutmeg and parmesan. I made the gnocchi gluten-free to honor the request of guests, but learned a hard lesson. Gluten-free gnocchi does not freeze well. I’ve frozen gnocchi made with all-purpose flour in the past and found that the dumplings respond well when added to boiling water. My gluten-free butternut squash gnocchi disintegrated in the boiling water within seconds. 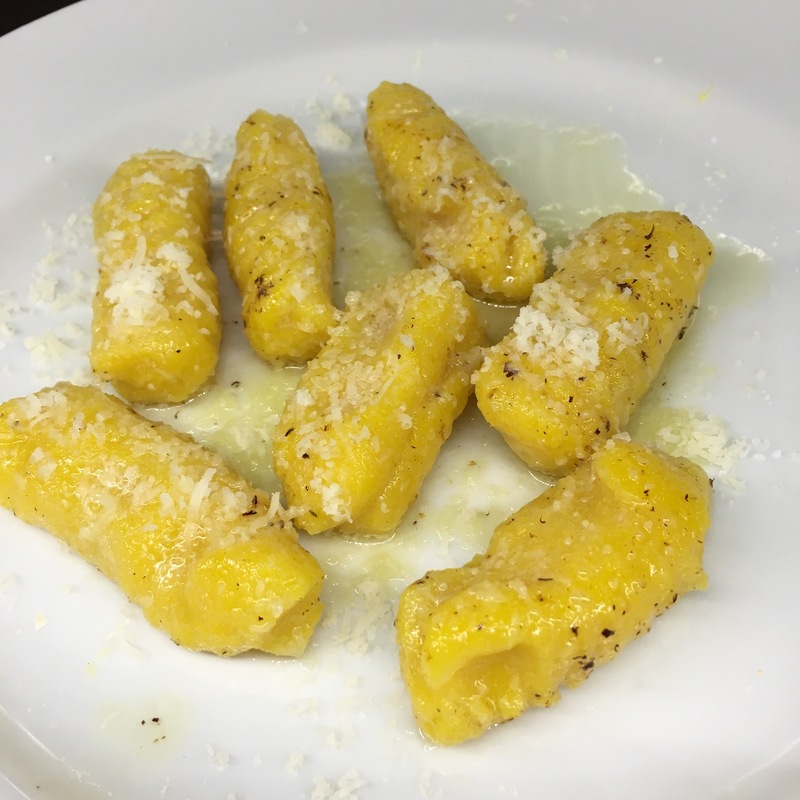 The above picture is indeed the gluten-free gnocchi that I taste-tested the week before. I hoped the sweet squash and fresh nutmeg would pair well with Scotch, but I’ll have to try that another time. Our guests were great sports about the calamity in the kitchen. The smokey, oily and peaty Caol Ila 10 from the Isle of Islay needed something substantial for a food pairing. Grilled or smoked meats do well against such Scotch. 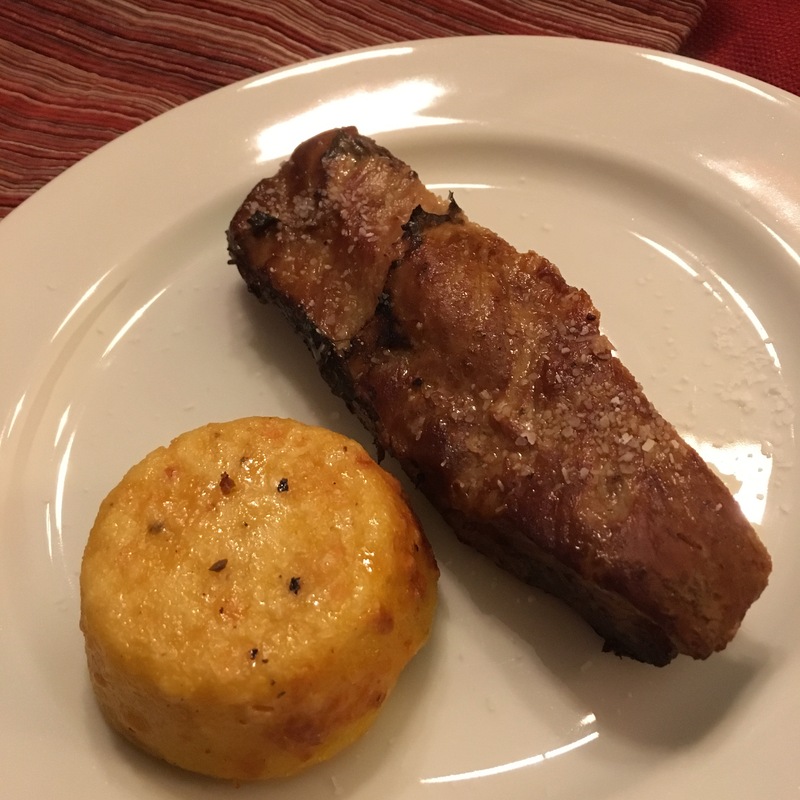 I smoked pork spare ribs and baked creamy polenta cakes which everyone raved about. Everyone quickly forgot the gnocchi blunder. 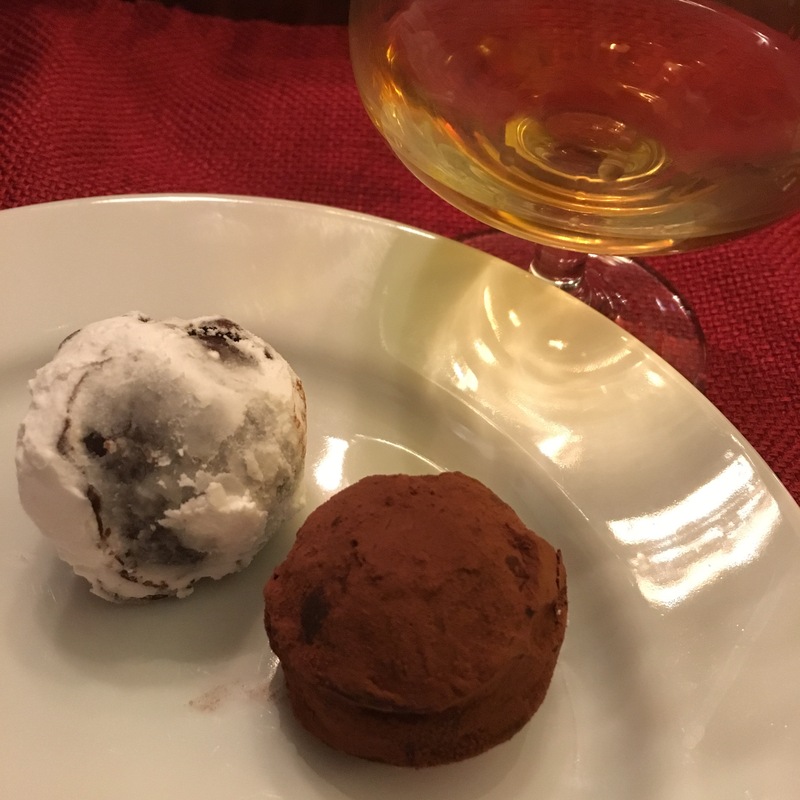 We finished the meal with Chocolate Truffles rolled in cocoa and white confectioner sugar paired with the Talisker 10 from Isle of Skye. Like the previous Scotch, the Talisker is smoky and oily with a peppery bite. Talisker is sometimes used in recipes for the chocolate ganache used to make truffles, but Curtis kept them separate for tonight for a simple pairing. The possibilities for pairing food with Scotch may be endless but consider a few constraints. Rich fatty foods like cheese, grilled or smoked meats and fish, sweet Fall vegetables, and chocolate really do well with Scotch. While black peppery foods pair well, I would avoid more intense hot peppers; their heat would overwhelm the flavors profiles of most Scotch. We may offer this dinner again at auction. 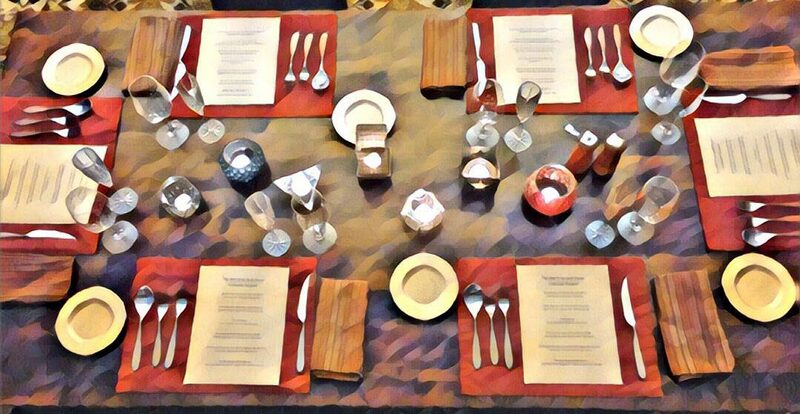 If you’ve successfully paired dishes with Scotch or other whiskeys, please share your experience in the comments below.